The traditional Islamic literature on Fiqh talks very little, if at all, about the issue of Muslims living in non-Muslim lands as a minority. At that time, the fuqaha had not come across such a situation much and accordingly not much was written about it. But today, one third of Muslims are living in non-Muslim lands as a minority. It is accordingly very important that aspects of fiqh related to them should be clarified. Lack of this clarity has resulted in massive confusion and misunderstandings among Muslims as well as non-Muslims. Many of the laws that are meant for the lands governed by Islamic law are presented by fear-mongers in west as if they are applicable universally. This comes with serious consequences for the whole community - Muslims and non-Muslims alike. It was in 1994 when the field of Fiqh Al Aqaliyat Al-Muslemah (i.e. Jurisprudence for Muslim Minorities) was formally introduced. Since then, a number of authors have written on this subject and the body of literature dealing with this matter is growing. 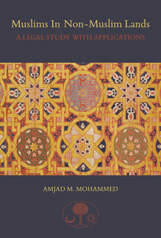 In this bookshelf, we have provide a lecture series on this topic from one of the pioneer researchers on the subject, Mufti Amjad Muhammad, some related works.